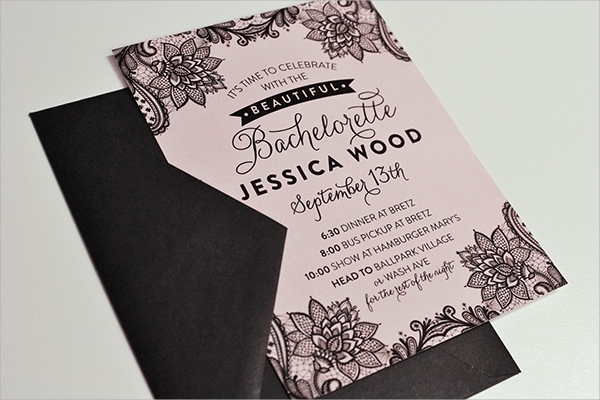 Designing for Bachelorette Invitation Template is a very demanding job. Every time you have to come up with a book cover that belongs to chick-lit novels. Limited options of flowers and paisley pattern, limited options of pink color and its shades can bring in a designer’s block for you. It is more or less like a “Pool Party Invitation Template” where you do not have many objects to play around. The current gallery that you are going to explore has some ready templates to cut down your designing woes a great deal. You can also see BBQ Invitation Templates. The eternal temptress is on a prowl in this design. 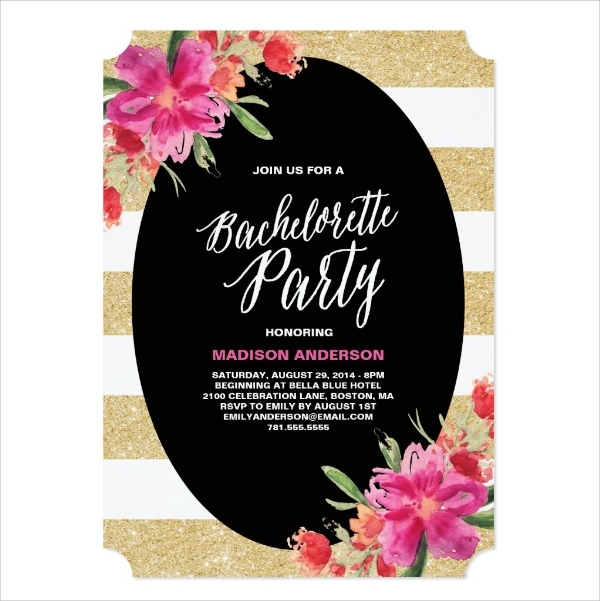 Purchase this 300 dpi printable template, fix the photo of a hot model in the middle and change the date of the party to finish an amazing invitation. 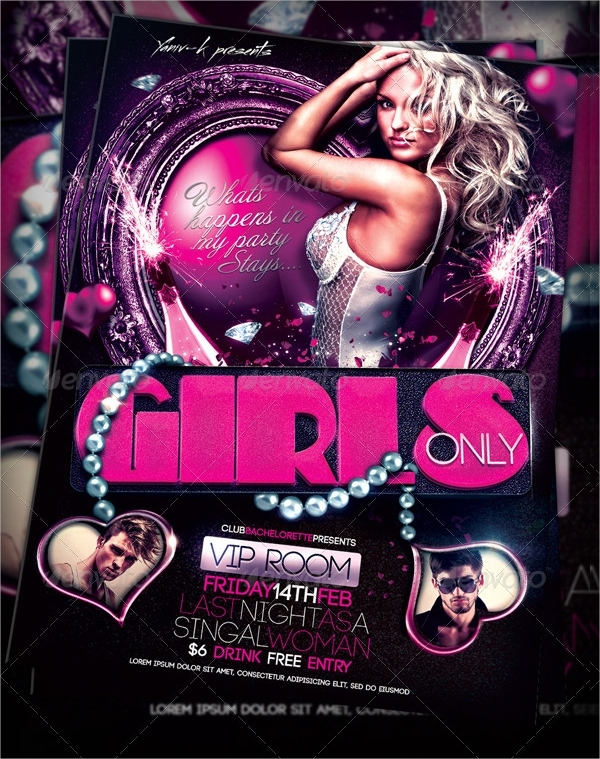 This invitation is available in three PSD files. They followed a simple color palate which will remind you of the days when printing with machines and adjusting different colors was a tough job. Even then, it is an evergreen design that never fails to attract people. The primary color scheme of the design belongs to the girlie colors of the rainbow. It has a prominence of pink color, it is editable and available in ready to print format. Just change the text matter and press the command to print it instantly. Here you will get two flyers clubbed together in a single package. It is a very sophisticated design. The addition of a thank you note with the main flyer is an innovative touch that they have given to it. 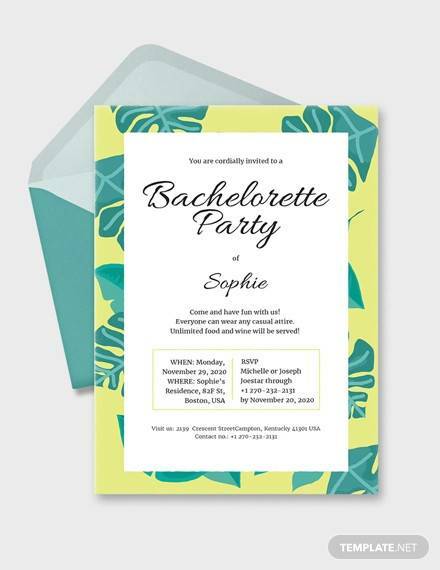 Revisit the charm of printed-paper and messages with this printable bachelorette party invitation. When you will scan it from a distance then it might look like a seasonal greeting card. However, after a close inspection, you will find that it is yet another addition to the list of printable bachelorette party invitations. Marked with floral boundaries this is a special invitation card. The color scheme is very soothing to the eyes and it is applicable on the fonts as well. It is an editable vector and you can easily mold it as per your needs. Black Oval and two pink flowers on each side of the front page, the middle of the oval talks about the invitation and your sentiments attached to the occasion. It is a bang on design for your party invitation. If you have a powerful text message, then this format can be the right choice because the text will emerge out as the best thing on the invitation card. You can also see Dinner Invitation Templates. A white paper signifies the simplicity of the message and fancy fonts denote the fun quotient of the party. It is decency clubbed with subtle naughty signals. An ideal printable and editable template at your disposal, purchase it and be ready to win compliments for your aesthetic senses. Sea, sand, sky, flippers, and hat can be considered as ideal ingredients for a beach party. This design plays with these elements very smartly. It is a subtle message for people with classy taste. This design is an announcement that girls are going to have a pajama party where they will have fun. It is a handmade design and elements of imperfection make it a visual treat for everyone. 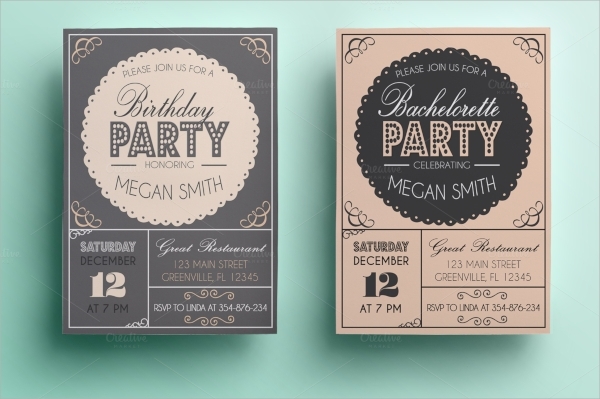 You can also see Vintage Invitation Templates. It is an ideal template when bachelorette party supplies are limited. It means that if you are organizing them in a pub or someplace with entry restrictions then you can use it as a ticket to the venue. They also left a column where you can print esteemed guest list with the main card. This is customary when you are inviting PRO’s and other dignitaries. 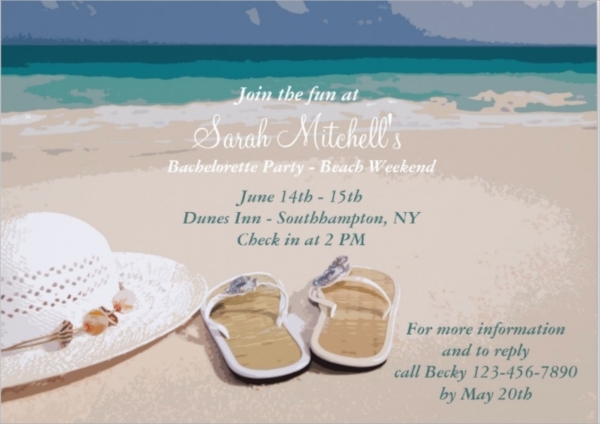 This sample format is a printable bachelorette party invitation. It is available in JPG format and after making necessary amendments you can directly send it for printing. Colors schemes are tested for print and this makes your job easy even further. They add zest with a feminine expression quite creatively in this design. The pitch black background enhances the mystery of the party. This mystical design can always represent an out of this world party very effectively. It is a British design that will transport you into the era of Jane Austen. Pick it up when you have a theme party which is based on the era of medieval Britain. It is a unique invitation for a bachelorette party when you want to set a different mood for the party. 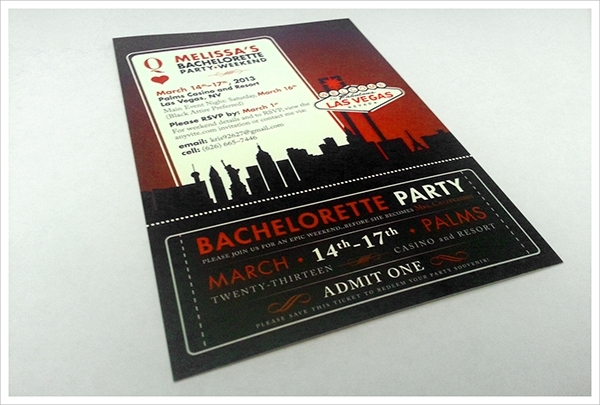 Most of these invitations can be considered as formal invitation templates for the bachelorette party. Over the years, a kind of standardization has been introduced into this department. This gallery mostly has premium designs to offer. If you wish to mark it for a particular target group then we can say here we are targeting people who receive a pool party invitation too often.